When Michael Jackson passed away in June 25 2009 last year, one of the surprising things was the fact that it was not the mainstream news like the Washington Post or the NY Times who reported it first; but rather it was a celebrity gossip website, TMZ who published the news first. The news was quickly adopted by Twitter users who then retweeted the news on to the world. From this, we can see the speed at which news can quickly travel across the world in mere minutes. According to Wikipedia, Singapore has one of the highest rates of lightning activity in the world. Did you know that our tiny island is struck by lightning every other day? Therefore statistically speaking, the odds of getting hit by lightning are exceptionally high, which makes the use of Surge Protection Devices or SPDs in most electrical installations, essential. However, to my surprise, many of us do not install SPDs as we have this belief that our electrical infrastructure (underground cables) is safe and reliable. Well, here’s an update with another of our own soccer star. As quickly as it started, we arrived at the final day of the exhibition. We got rid of the lounge suits and put on our pit crew shirts, a refreshing change to eye for the visitors. Decked out in our florescent green and black pit crew shirts, we would have probably looked more at home at the F1 track just down the road instead. Yes! Yes! Yes! 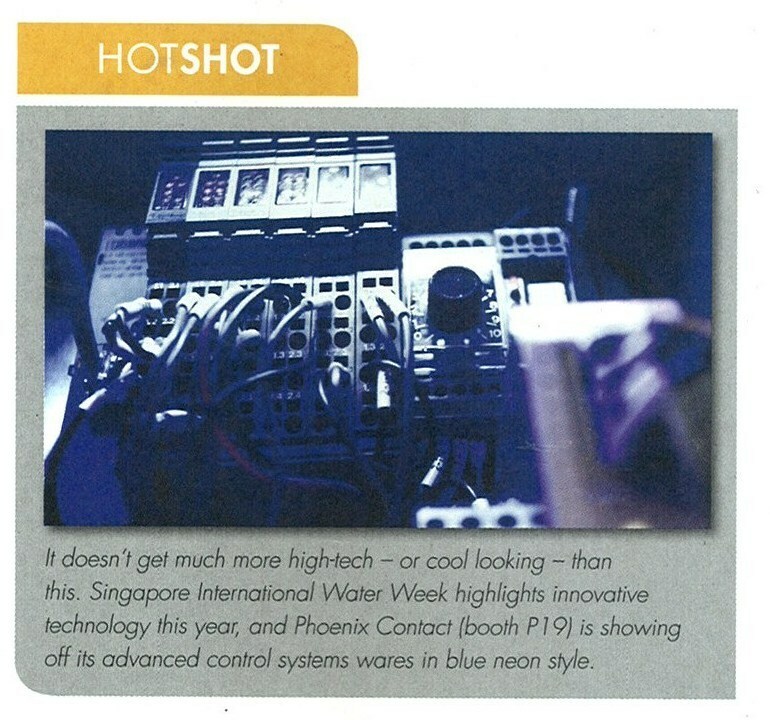 We were FEATURED in the ‘HOTSHOT’ section of the daily SIWW newsletter! 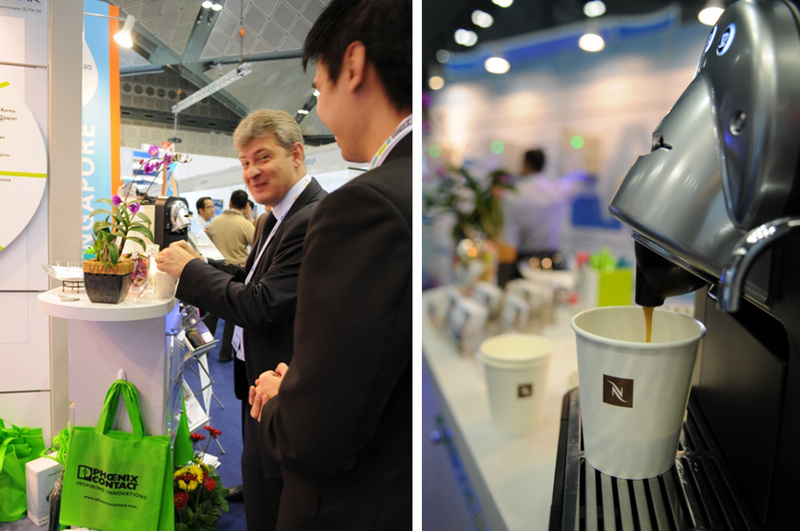 What with standing all day and walking around checking out other booths, it was only natural that some of us were probably feeling a little cranky , we decided that a little caffeine would help boost the morale, and we figured it would do likewise for the weary visitors! And it worked like a charm! The rejuvenating aroma of premium coffee wafting ever so gently through the air never fails to uplift the spirit, even for those who do not drink it. And finally, here is irrefutable evidence that the iphone craze has hit us. Can you actually believe how crazy our guys can get over iphone apps? But that is a good sign. As innovators, we should always keep up with the latest technology. 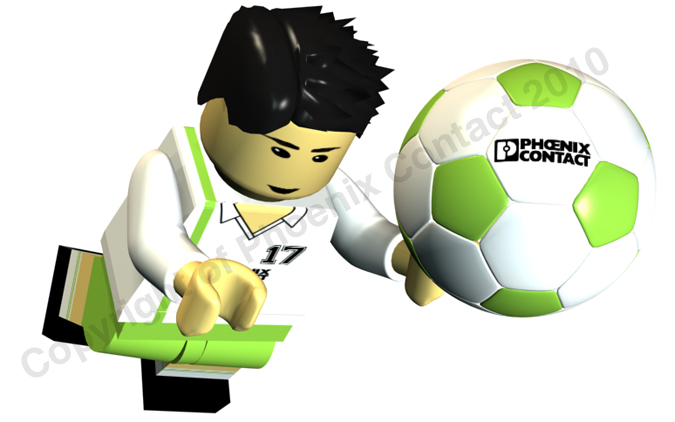 With all the hype of the 2010 World Cup, it is easy to get drawn into all the revelry. It permeates into all aspects of our daily life and it certainly has influenced my designs at work. Being tasked with designing an identity for our Business Development Team, I drew on the idea of using the strategy board soccer mangers used to plan their attacks and defense. Each member has a part in strategizing and contributing to the success of the team. Each strategy is a precise execution of individual and team play. 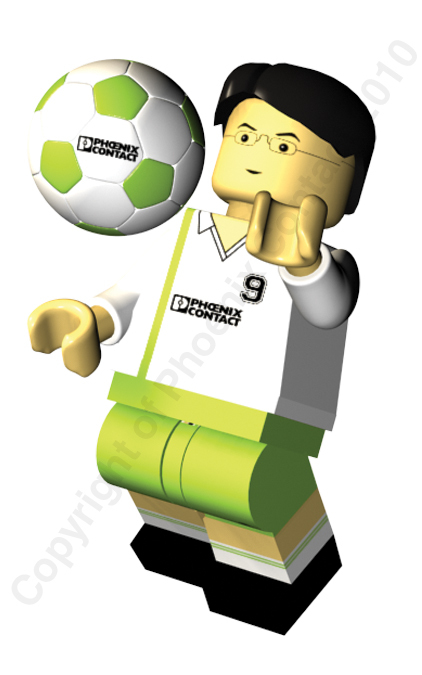 So in my design, each member is represented by a 3D lego minifig dressed in Phoenix Contact SEA’s own soccer jersey. I’ll be sharing images of these figures over the next few days. Here’s the first of the figures. Any guesses who might this be? 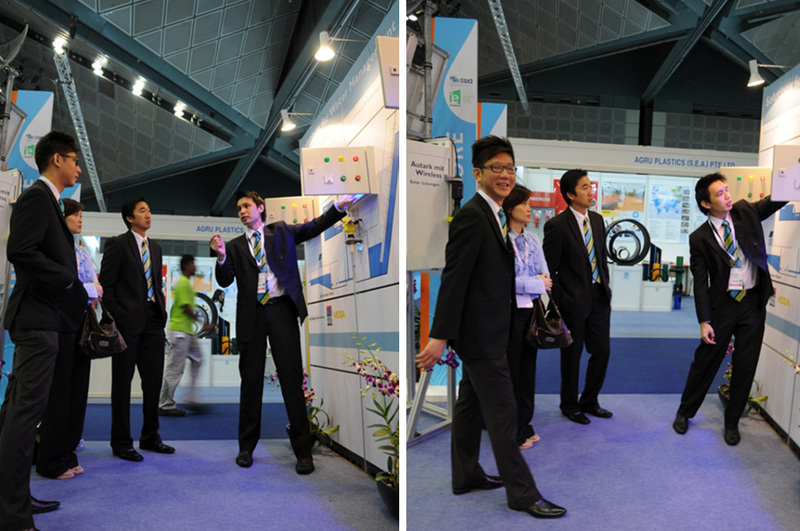 On our exhibition panels displayed at the Singapore International Water Week, we featured a full waste water reclamation process. These panels were supplemented by actual working demo kits comprising mostly Phoenix Contact products. However, to provide a complete solution, we were fortunate to have control boxes from Rittal and field instruments from Vega Instruments. A big ‘Thank You’ to our Strategic Alliance Partners for their sponsorship. What is Strategic Alliance Partnership? It is a initiative for our partners and us come together to synergise and leverage on each others’ strengths. In effect, maximizing gains in Marketing activities or Project Sales potential at the lowest possible cost. Let me share a little bit more about our partners. Rittal is a systems supplier for industrial enclosures, power distribution and junction boxes. 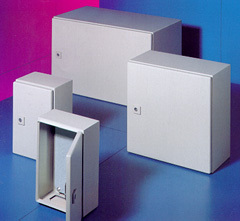 Their range of boxes include stainless steel and plastic enclosures. Vega instruments provided us with the Level Transmitters which uses the latest radar technology to calculate and monitor the level of the liquid! Finally, the finished product is ready for showcasing. When I look at the completed setup, all our toil and sweat became worthwhile. 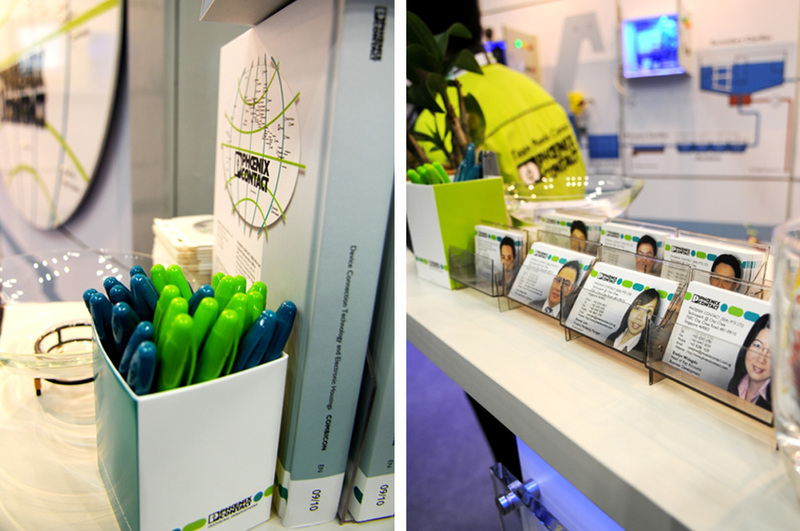 If I may say so, I think our booth was the most complete among all the exhibitors, featuring a whole water process flow with our products simulating the controls at various stages. But then again, you have to decide for yourself. 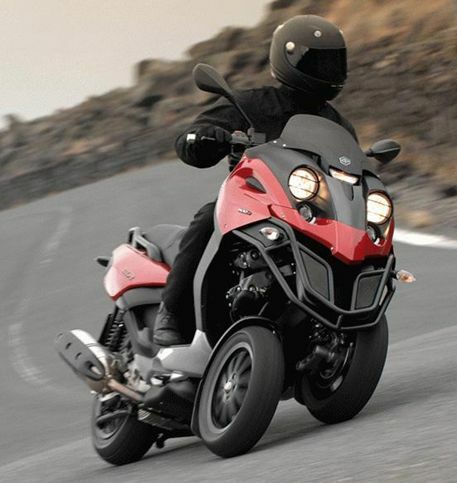 Take a look at the photo and give us your comments. Anyway, we put our slippers, shorts, t-shirts and sweat behind after the set up and after an amazing transformation, swans emerged from ugly ducklings, or should I say penguins emerged. See how smart everyone look in their lounge suit. Kudos to our people! 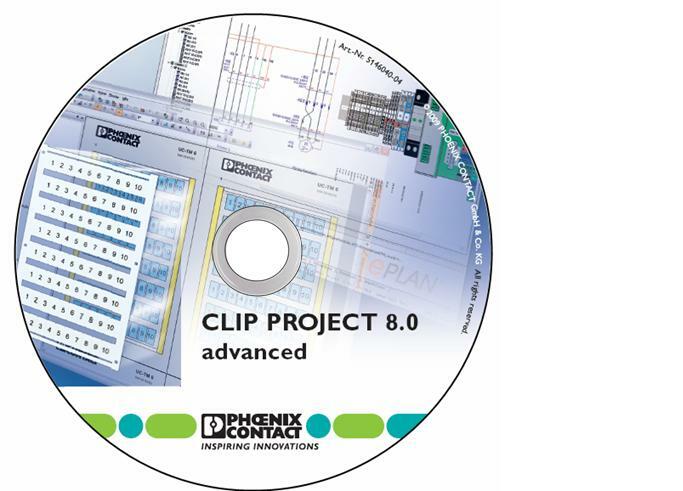 Clip Project combines our proven rail design planning software with easy-to-use marking software for all your industry cabinet needs. This software updates automatically via the Internet so you can be sure you will always have the latest product information. 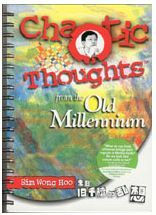 This article is an excerpt and adaption from a piece written by our well known local entrepreneur, Mr Sim Wong Hoo, the CEO of Creative Technology from his book, “Chaotic Thoughts from the Old Millennium”. “NUTS” stands for “No U-Turn Syndrome”. NUTS depicts a situation when you want to do something and you seek approval of a higher authority. You believe that when there are no rules saying that you can do such a thing, then the standard answer is “NO”! In Singapore, it is the reverse. When there is no sign on the road, you are not allowed to make U-turns. When the authorities allow you to make U-turns, then they will put up signs to give you that right. The two different systems serve the same purpose – to better manage the traffic. They may look quite similar, just coming from different direction, but the social repercussions are significant. 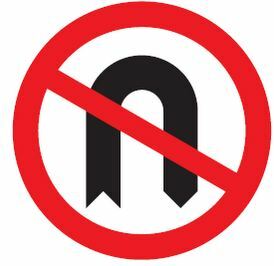 In Singapore, the no U-turn without sign culture has permeated every level of our thinking and every segment of our life. 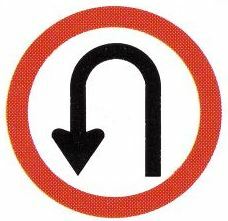 This no U-turn has created a way of life that is based on rules. When there is a “U-turn” sign or when there is a rule, we can U-turn. When there is no sign, we cannot U-turn. When there is no rule, we cannot do anything. We become paralyzed. Me : Mam, I am not fishing. Let me show you that there are no hooks at the end of the line and I am just practicing my cast just like a golfer practices his swing. MOL : This field is for sports. You cannot do this here. Me : Mam, Fly fishing is a sport and this is public property. Those joggers are outsiders, if they can come in here to jog, I can come in here to cast. And may I know who you are? MOL : I am the principal of this JC. Please leave the premises immediately (it was obvious to me by now that this old lady does not know what fly fishing is all about)… or I have to get my staff to evict you. Me : Mam, if you want me to leave, then you’ll have to get all the joggers to leave too. I pay taxes just like they do and I am entitled to use this premises just like they are doing. MOL : You must leave in 5 mins or I will get my staff down (angrily walks away and drove off). A much nicer and younger lady teacher did appear later and while she understood my point of view, I recognized that she was just doing her job and I did not want to inconvenience her, so I decided to pack and leave. She thanked me for understanding the difficult situation she’s was put into. Well, the point is this. Do you want your children to be studying in a school whose principal is so rigid and does not even know what fly fishing is all about (despite it being portrayed so gracefully in Robert Redford’s film, “A river runs through it”?). It’s almost as good as a teacher or principal saying, “Is the America’s Cup a Soccer event?” I shudder at the thought of what the future of Singapore will be like if children grew up under such parochial tutelage. This principal was definitely a case of NUTS. Quite frankly, I’ve seen a few examples of NUTS cases, but I’m also glad to see many other cases where NUTS is definitely not the prognosis. As a management team, we have deliberately not put in place many regulations so as to nurture the flow of creative juices among individuals. Without citing specific cases, I certainly hope that we reflect upon our past actions and see if we are indeed suffering from NUTS. And the cure for NUTS? Well, that’s for another article.